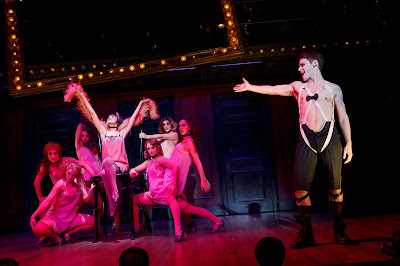 Like many successful musicals, Cabaret, which is now playing on the Hippodrome stage, entertains with excellent songs and staging, but navigates through a layer of darkness as part of the plot. 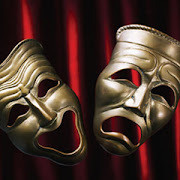 Historical events or serious social issues are frequent backdrops to these types of productions. The Sound of Music, Rent, Avenue Q, Carousel and Spring Awakening come to mind as other examples. The plot that encompasses several sets of relationships among disparate individuals takes place with stirring drama while the Kit Kat Klub, a seedy nightclub in 1931 Berlin provides the escape, albeit temporarily, from the stark reality, which is engulfing Germany and ultimately the world beyond its doors. Outside? Not so much. Not with the ominous political changes poised to occur. 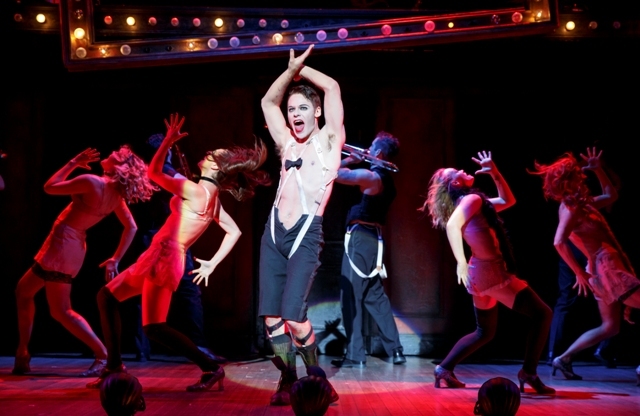 Cabaret is a six-time Tony Award winner in 1967 that spawned many revivals on Broadway and London in addition to numerous tours (this production is being presented by the Roundabout Theatre Company) and the popular 1972 movie. 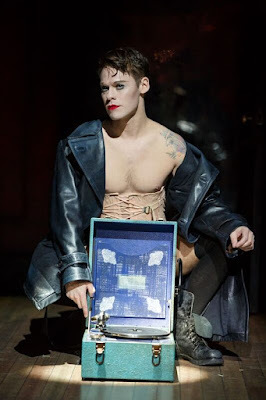 With music by John Kander and lyrics by Fred Ebb, Cabaret, which was ultimately adapted from the book Goodbye to Berlin (1939) by Christopher Isherwood, is distinguished by its sterling catalogue of music. Well-known songs, such as the aforementioned “Willkommen” as well as “Maybe This Time,” “Tomorrow Belongs to Me,” and, of course, the title song, have made the show endearing, and the production at the Hippodrome is no exception. Under the direction of BT McNicholl and original direction from Sam Mendes and Rob Marshall, the Hippodrome mounting excels in an intricately staged spectacle that showcases an abundance of outstanding performances by the leads and the ensemble. Robert Brill’s set design is not as aesthetically gorgeous as one would see in many musicals but it is very clever and functional in its simplicity. A stage-wide but narrow-in-depth set represents the boarding house with several doors in a row denoting the main entrance and individual rooms outside of which most of the action takes place. Other scenes away from the boarding house also occur on that portion of the stage thanks to effective lighting design by Peggy Eisenhauer and Mike Baldassari. The illumination, except for several cabaret numbers performed by the talented and limber Kit Kat Girls and Kit Kat Boys where a bright spotlight shines, is often maintained at a rather dim level to symbolize the reality of the characters’ relationships and the looming darkness of the world outside. Above the stage is a catwalk with two spiral staircases on each side where performers use to descend to the lower stage. That is the locale for the orchestra/Kit Kat Klub band, which is comprised, in part, of ensemble performers who double as musicians. In the middle of that level is a large transparent box, which serves as a frame for cabaret-style blinking lights. That box is deliberately tilted, which, in my view, signifies the world is askew and off center. It also figures prominently in “Entr’ Acte,” a number that kicks off the second act where most of the Kit Kat Band crams the box to perform. Unquestionably, the entire cast makes this production soar with their acting and vocal talents. The show’s lead is Randy Harrison as the puckish Emcee of the Kit Kat Klub. Audience members may recall his role as Justin on Showtime’s Queer as Folk from 2000-2005. Matured but still youthful and more buff since those days, Mr. Harrison gives a tour de force performance with his astonishingly strong vocals (“Wilkommen,” “Two Ladies,” “Money,” “I Don’t Care Much”) and comedic moves including ambling into the audience at the beginning of the second act to playfully dance with a couple of audience members. Wearing ghoulish eye make-up and bright crimson lipstick, Mr. Harrison is called upon to don a wide array of William Ivey Long’s creative costumes from undershirt/boxers garb, to a storm trooper outfit, to drag, for his burlesque-style character. He performs the role with relish. Co-starring is Andrea Goss as Sally Bowles as the headlining British singer at the Klub. Despite her singing prowess, she seems to hold a job only if she sleeps with someone. Sally meets an American writer Clifford Bradshaw and then fall in love, it but doesn’t end well. Ms. Goss performs two major numbers, “Maybe This Time” and “Cabaret” with a resoundingly sweet voice. Another love affair takes place between Fräulein Schneider, played by Shannon Cochran, an elderly owner of the boarding house where Clifford resides and Herr Schultz (Mark Nelson), an elderly fruit shop owner. Things go adoringly well until Fräulein Schneider learns that her beau is Jewish and the conditions in Germany are too dangerous to consider marriage. A brick thrown through his store’s window was the last straw and sadly, she breaks off the engagement. They play their roles with sensitivity and charm, and their performance of “Married” is done movingly. For comic relief there is Fräulein Kost (Alisin Ewing), a prostitute who rents from Fräulein Schneider where no member of the Navy is safe from her lure. Ms. Ewing does a fine job in portraying the character with the right touch of humor. Also, Ned Noyes as Ernst Ludwig, a man who had met Clifford and recommended him to the boarding house, does well in his role. He later is revealed as a Nazi and who warns Fräulein Schneider to drop her marriage plans. Then there are the Kit Kat Girls and the Kit Kat Boys who sing, dance, and play instruments throughout and ably contribute visible energy to the show. Kudos go to Michael Gibson for overseeing the orchestrations. This is an enjoyable musical on many levels that presents outstanding performances by the well-directed talented cast and ably supported by the technical and design teams. So come to the Cabaret and leave your problems outside. Cabaret runs through May 1 at the Hippodrome Theatre at the France-Merrick Performing Arts Center, 12 N. Eutaw St, Baltimore, MD 21201. For tickets, call Ticketmaster at 800-982-ARTS or visit Ticketmaster or the Hippodrome Theatre. .
To be clear, the headline I had submitted to my editor read, “Community Center in need of funds to hold Pride.” It was changed by the editor. I saw nothing wrong with the revised headline because it captures the information that the GLCCB has been putting out. I also stand by the facts contained in the article, which in actuality, is a regurgitation of what the GLCCB has said through various appeals. On the Razoo fundraising page a similar message is written: “Without these funds, we will be unable to move forward with Pride 2016.” Mr. Lyles also makes the same claim on the GLCCB’s own Facebook page! Now, Mr. Lyles is saying in effect, well this is not actually what we meant. Really? In his statement, Mr. Lyles contends that there is $65,000 on hand and another $35,000 due in a few weeks. 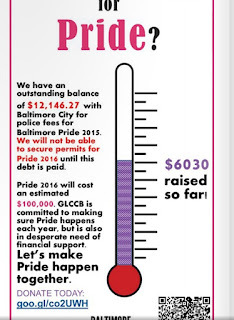 The question begs, threatening that Pride cannot proceed if the outstanding debts aren’t paid was just a ruse to scare the community into giving donations? To raise money under false pretenses is irresponsible if not fraudulent. At a minimum, it’s not the way a 501(c) (3) organization should be running. He also questioned my reporting of the $200,000 Pride budget. Well, that came directly from the published board meeting notes. (See image). If this is not true, perhaps they should review the minutes prior to publishing them. If there are any misconceptions, they could have been clarified by comments by Mr. Lyles before the article was submitted and published. 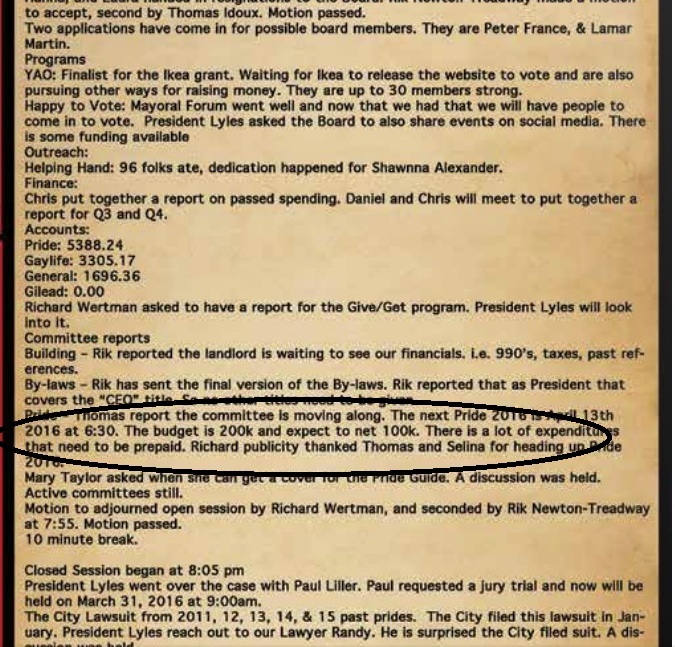 With his oft-repeated mantra of “transparency,” it would be helpful to the GLCCB and himself if he can learn to work with the press as so many other able LGBT leaders have done in the past. 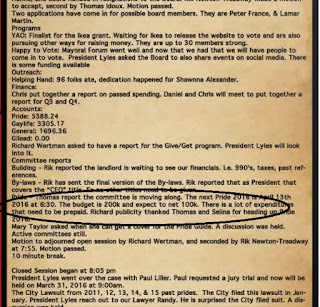 However, Mr. Lyles has taken a path whereby he not only eschews working with me—the only bona fide local LGBT news reporter (I have performed this service for nearly 36 years)—he simply ignores my requests for comment. That arrogance is irresponsible and does not serve the GLCCB and its supporters well. I had offered to meet with him a couple of months ago to discuss a working relationship that would be helpful both to the GLCCB and my ability to inform our community, but guess what? He ignored that offer not once, but twice! Instead of airing his grievances privately as any competent professional would do, Mr. Lyles chooses to vent on social media believing he can rally the troops against me. However, that won’t result in commitments from the community the GLCCB “desperately” needs (their words). 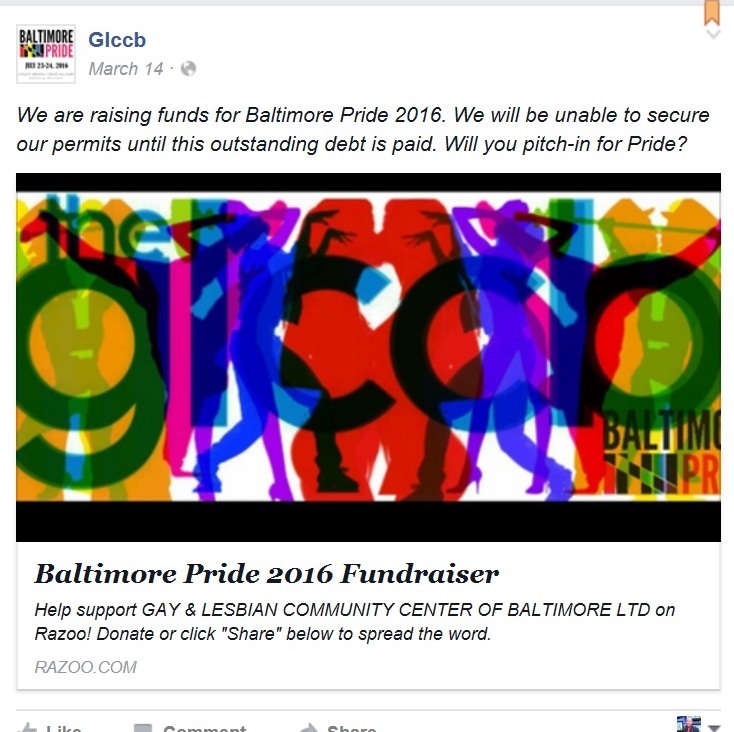 The Razoo fundraising page had shown 3 donations for about 7 weeks since it began. 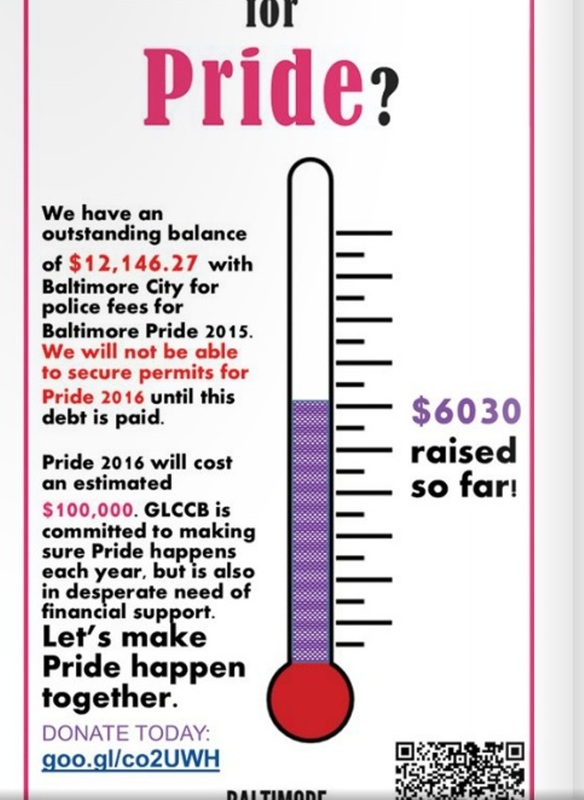 Since the article was published it has doubled to a whopping 6 people—out of the entire Mid-Atlantic region who would potentially attend Pride. The total is at the moment $6,220 with a goal of $15,000 and three days left. Of that amount, $6,000 came from a single donor the day the drive began. Five donors and $220. If that isn’t a red flag, then I don’t know what is. Go ahead, blame the messenger. It’s not going to help one cent. Jabari Lyles, you have much bigger problems. With the battle of NY over and most pundits concluding the delegate math is too daunting for Bernie Sanders to reach the convention ahead of Hillary Clinton in pledged delegates, the talk is turning to a “what’s next?” phase. As such there is widespread fear among Democrats that the Sanders team will not unify behind Clinton in a way in which she did so when Barack Obama eventually amassed the number of delegates to win the nomination. A Democratic Party who is not fully behind the standard-bearer is something to be concerned about even if the Republican opponent is a flawed candidate like Donald Trump. Despite the hand-wringing by GOP “establishment” types over the looming possibility that Trump will secure the nomination prior to the convention in Cleveland, most will hold their collective noses and reluctantly support Trump because he will be matched up against the dreaded Hillary with the Supreme Court balance (a huge priority for Republicans) at stake. Though current polls indicate Clinton beats Trump in a head-to-head contest, a unified Republican Party versus a fractured Democratic Party can bring upon unpredictable results. You can throw these early polls out the window. What should the Democrats do to combat the catastrophic possibility of a Trump presidency? Unless they unify and get out the vote, anything can happen (Trump winning, for instance), and that’s a risky proposition. The Sanders candidacy is a movement (he characterizes it as a revolution) that appeals to the left wing of the Democratic Party and has attracted independents as well. His candidacy has energized this sector of the party like no other, and although it will not be enough to win the nomination, there are too many votes to be had if they are not mined effectively. 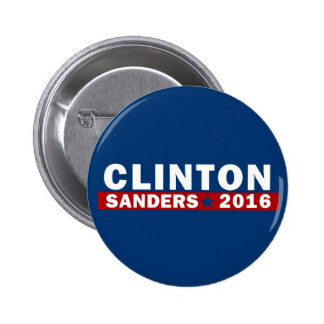 A way to help unify these factions would be to name Sanders as Clinton’s running mate. While they have both been negative towards each other in recent weeks, that should not be a deal breaker. In recent history, John F. Kennedy and Lyndon Johnson weren’t exactly best buddies but necessity forced JFK to name LBJ to help win the prize of Texas and other southern states. They prevailed in 1960’s close election. Ronald Reagan and George H.W. Bush formed an alliance, too, despite a testy primary battle. They won in 1980. The battle between Clinton and Sanders was not nearly as contentious as these pairings, and the differences between the two could be smoothed over if Sanders wrings some concessions from Clinton regarding the party’s platform and promises to move to the left on key areas of policy. Giving him a major role in the Clinton administration as vice president will enhance his chances to effect these changes—infinitely more so than if he remained in the U.S. Senate. The fact that Sanders is in his 70’s and Clinton flirting with 70 should not be a deterrent. Both appear to be in excellent health and Sanders’ legion of young followers love him irrespective of his age. Besides, Trump is around Clinton’s age so there is no generational chasm among the candidates. An energized, unified Democratic ticket would demolish Trump by historic proportions even if the GOP gets behind the mega-wealthy charlatan. If such a landslide takes place, the Democrats could regain the Senate with a veto-proof majority, thus putting them in the driver’s seat to change the leanings of the Supreme Court after over a half century of conservative tilt. This possibility is something both camps should seriously consider. 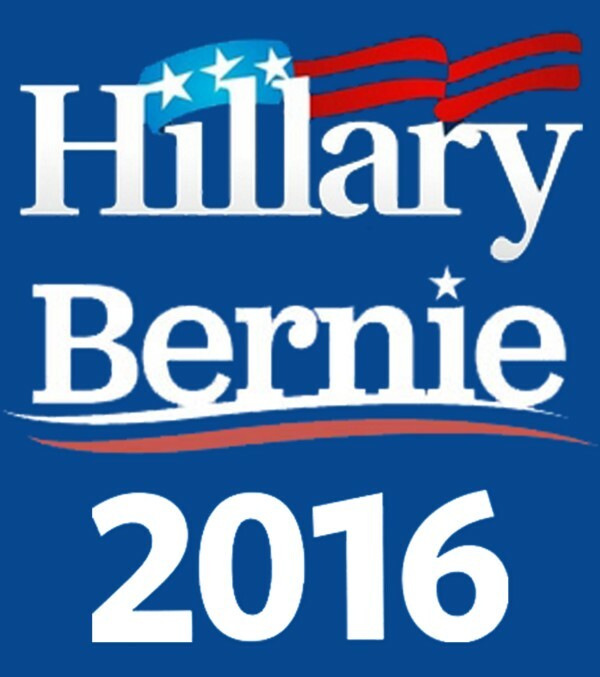 Both Clinton and Sanders would benefit greatly from the union as they both need each other to accomplish their respective goals: Clinton becomes the first woman president and Sanders, with a stronger Democratic make-up in Congress, would be in a powerful position to accomplish his goals. Clinton brings to the election massive support from women and minorities; Sanders contributes with younger, idealistic and left-leaning individuals. Trump’s base of angry white men is way insufficient to counter these demographics. 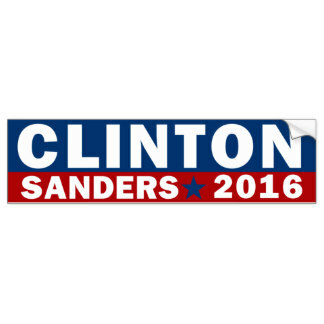 Clinton-Sanders is a winning combination that would put the Democrats in sound footing for years to come. They should seriously consider it. The Olney Theatre Center is presenting Knott’s classic play in a taut, well-staged and performed mystery under the masterful direction of Jason King Jones. Dial ‘M’ is not the typical whodunit since the audience is already primed on how and why the crime was committed. Its strength lies with how Inspector Hubbard (played superbly by Alan Wade, a 44-year veteran of the Olney Theatre Center) puts the pieces together to eventually solve the case. Even if you saw the movie version, the building drama and tension will leave you at the edge of your seat. The play has its share of blackmail, greed, jealousy, deception and a considerable amount of brandy consumed by the characters. Keys, love letters, stockings, hand bags, an attaché case, scissors, and a rotary telephone all play a hand in this edgy mystery with a little dose of well-placed comedy sprinkled throughout. Set in 1952 London, ex-tennis pro Tony Wendice (Ashley Smith) plots to off his cheating wife, the wealthy socialite Margot Wendice (Nisi Sturgis) to inherit her money. He follows an acquaintance from Cambridge University Captain Lesgate or the alias C.A. Swann (James Konicek) to gather the goods on him so that he can blackmail him into killing Margot in an intricately detailed scheme. Of course, the murder doesn’t go off as planned. If it had, the play would have ended in less than an hour. The twists and turns, the circuitous route Inspector Hubbard takes to solve the case and the outstanding technical support make this a must-see occasion. All the action takes place in the mid-century modern living room of the large London flat belonging to the Wendices. 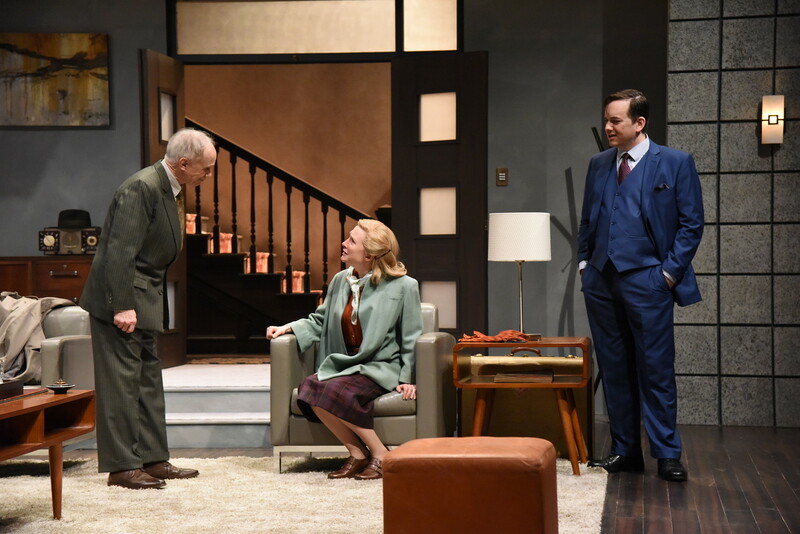 Charlie Calvert designed an attractive and functional set whereby every piece of furniture, every lamp, every door and, of course, the bar, has a role in the play’s visual appeal and action. There is a secondary set consisting of a staircase outside the front door that serves as a “key” part of the plot. Then there is Sonya Dowhaluk’s lighting design, which effectively utilizes fading, blackout and brightening techniques as well as the mysterious silhouette effect outside the front door to augment the dialogue and action. Adding to the dramatic atmosphere is the mystery-style background music similar to what is heard in cinema. It’s a great touch and Sound Designer Roc Lee pulled it off brilliantly. Mr. Lee also provided the sound of off-stage voices including those from the other side of the phone. The performers are mic’d well with their lines heard with clarity. A good play with superior technical elements deserves solid acting, and the ensemble cast of Dial ‘M’ for Murder does not disappoint. Thanks to dialect coach Zachary Campion, the performers consistently maintain British accents throughout their on-stage adventures. Ashley Smith convincingly plays the antagonist Tony. His exchange with Captain Lesgate/ (James Konicek) when he conjures up one Lesgate/C.A. Swann misdeed after another to blackmail him is one of the play’s highlights. Mr. Konicek is splendid in that scene, which helps to make it work so well. On stage through most of the play, Mr. Smith demonstrates the poise and confidence of the former professional athlete that he plays and a command of virtually every scene with his dialogue and movements. Nisi Sturgis, as Margot, wins the audience over. Though she had been involved in an extramarital affair with American murder mystery novelist Max Holliday (Cameron McNary), Ms. Sturgis’ Margot elicits sympathy as the intended victim in this caper and the one who is ultimately wrongly accused. Mr. McNary does a good job as Max. Alan Wade shines as the intrepid Inspector Hubbard. Toying with his suspects (first Margot then Tony) and feeling them out as the investigation proceeds, Mr. Wade elicits fond memories of TV’s Columbo character (“One more question, please”). Tenacious and clever, Mr. Wade gives heft to Hubbard. All in all, the Olney presentation of Dial ‘M’ for Murder is a riveting experience and patrons are sure to have a jolly good time even with a killing on the stage. Dial ‘M’ for Murder runs through May 1 at the Olney Theatre Center, 2001 Olney-Sandy Spring Road, Olney, MD 20832. Tickets may be purchased by calling 301-924-3400 or by visiting here.